Are Your Kids Overdosing On Sugar? Not many parents would willingly admit their kids are eating way too much sugar, and yet most of us have kitchen cupboards filled with products containing high levels of sugar. Even if you think the foods you buy are reasonably healthy, the chances are they contain hidden sugars, which you might not even realise are there. Not only does sugar make food taste sweeter, but sugar is often used as a preservative, making it a staple ingredient in many of your household favourites. While many parents now realise that fizzy drinks are not a healthy choice for their child’s lunchbox, many of us are still unaware of the dangers of hidden sugars. For example, did you know a slice of white bread could contain as much as 3 grams of sugar? 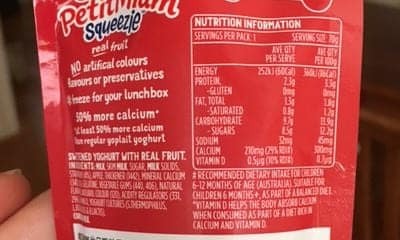 Or a 70 gram kids squeezie yoghurt could have around 8.5 grams of sugar or more? To put that into perspective, a standard teaspoon is a little over 4 grams. So whenever you look at the nutritional information on food labels, it helps to see grams as teaspoons. The above squeezie yoghurt contains two teaspoons of sugar per serve. 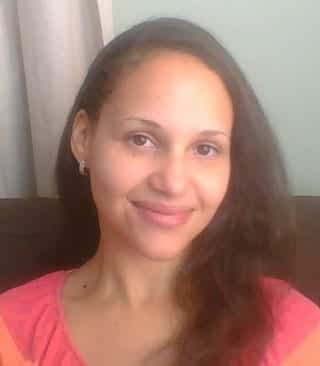 It’s believed that most of us are eating way more than our recommended daily intake of sugars. Even very young children are thought to be consuming about three times the amount of sugar they should be. Although some natural sugar can provide calories and energy for a growing child, a surplus of sugar is definitely not a good thing. The eating habits we learn in childhood can last us a lifetime, and that’s why it’s so important that we encourage healthy eating habits at the dinner table. The sad thing is, many parents actively try to do this but their efforts are hijacked by hidden sugars. For example, you might think a delicious meal of pasta with sauce and plenty of veggies would be a great addition to your child’s diet. It might be, but if the sauce came from a jar, it likely contains high levels of sugar. Reading the sugar content on product labels — even on seemingly innocent foods — can be startling. Personal trainer, Dan Sweeney, is on a mission to educate parents about their family’s eating habits. He wants to encourage parents to think twice about how much sugar their children consume each day. In his great new video Are you overdosing your kids on sugar? we see just how much sugar the average family can consume – just at breakfast time. The video shows a typical family scene, with kids sitting down to tuck into breakfast while a parent organises packed lunches. We’re shown just how much sugar each of the foods contains. The son’s cereal has 2.2 days’ worth of sugar in it. We see the food switch to sugar as it’s being prepared. Warning: it will probably make your teeth wince when dad comes in and downs a can of sugar for breakfast. As the little boy waves goodbye to his mum at the door, we see sugar leaking out of his lunchbox. The son will have consumed five days’ worth of sugar by the time he gets home from school later that day. Scary, isn’t it? The video ends with a shot of mum feeding her baby from a jar of puréed baby food – another food source likely to contain high levels of sugar. The video is hard to watch, especially because it’s such a typical morning scene that can no doubt be found in any number of family homes across the Western world. Parents think they are giving their children healthy foods, but in fact these processed foods contain high levels of sugars. In 2015, the World Health Organization changed its official guidelines on sugar consumption. The organisation previously stated that people should consume around 10% of their daily total energy intake from sugar, but this has now been reduced to just 5%. It’s vitally important that parents learn more about sugar. Not just how much their children should be consuming throughout the day, but also the places sugar might already be lurking in their diets. We need to know more about the food choices we make, because if the average child is eating three times the recommended amount of sugar each day, we clearly aren’t doing enough to protect our children’s health. Recommended Reading: If you can bear to watch another video that will make you want to scrub your teeth immediately, take a look at If Soda Commercials Were Honest.